This year I have moved from teaching university to teaching high school. Ask me about it another time: I’ll tell you in detail about it. My academic friends might be particularly interested in what the transition involves, but the main difference is something like this: being an university lecturer requires you to synthesise a vast range of sources and ideas into the conceptual understanding that makes up a scholar’s theoretical toolkit or “research profile”. Teaching high school requires you to take those big ideas and fragment them into a series of engaging, memorable and constructive tasks, enabling students to find their own way into the theoretical terrain. So, that’s what I’m doing right now. I have to remind myself what it was like not to know what semiotics is, or why film theory can be a useful tool rather than a giant muddy puddle in between me and the movies. And yes, that thing that academics often resent in education is especially true in school: you have to make the subject entertaining. Because if you don’t have their attention, you’re going to lose them, and they’re going to learn nothing. This month our topic is film genre, and we’re looking at musicals. 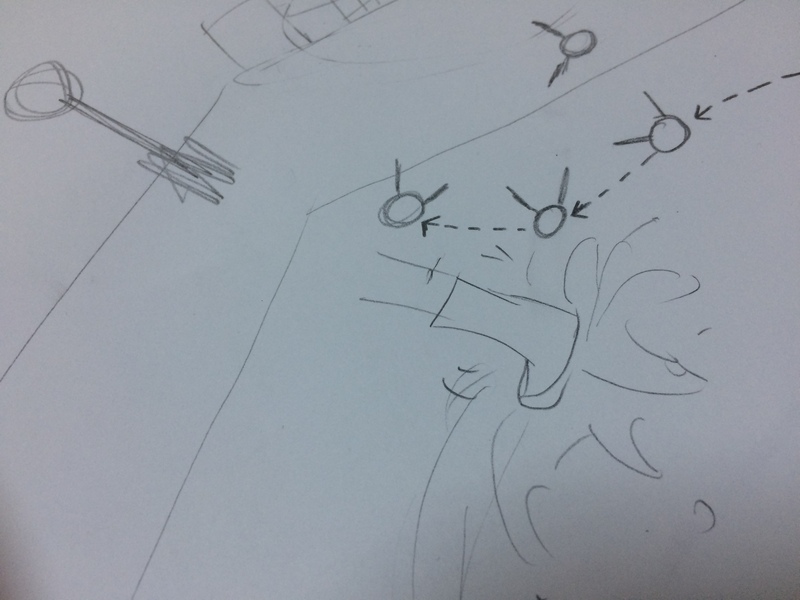 My students were asked to sketch a diagram of the Singin’ in the Rain dance sequence to develop their skills at observing and describing filmic space. 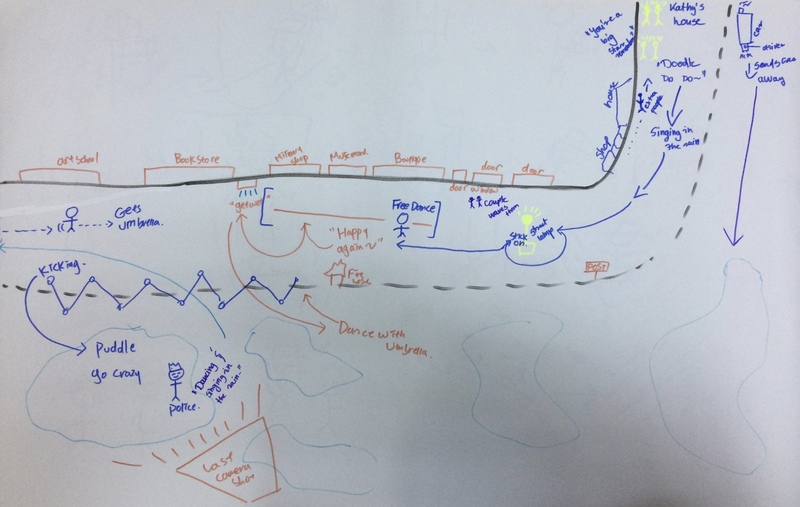 In three groups, they drew a plan of the set, indicating camera position, lines of movement, key elements of staging, the location of extras and anything else that occurred to them while watching. I also asked them, where possible, to indicate the approximate position and distance of cameras for each shot. I think (i.e. I can’t always trust my powers of recall) that I inherited this idea from my friend and former colleague Helen Hanson after hearing that she’d used a similar technique in a class on continuity editing. I’ve used it several times since. It’s a great, fun exercise for film students. 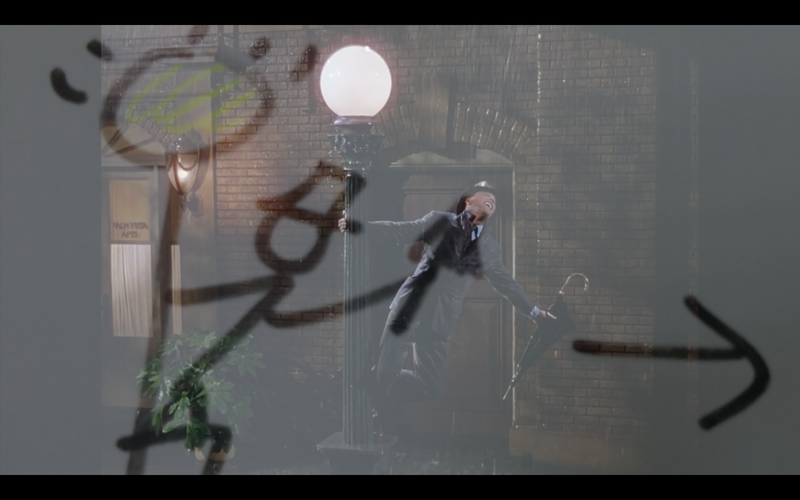 Because films often construct space in separate shots (we never get a complete long shot of the entire set in which Gene Kelly dances in Singin’ in the Rain), trying to reconstruct the entirety of the space in which a scene takes place demonstrates how we the viewers use the spatial information in those shots to stitch together the pieces of the setting in our minds. Even if a scene was shot at several different locations, you should be able to draw a complete, coherent diagram of a single set as proof of how effectively a film establishes a similarly coherent spatial location for its action. 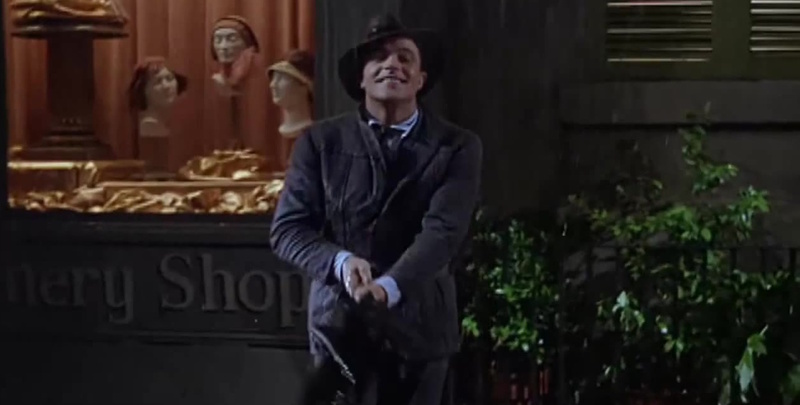 It helps that Singin’ in the Rain is meticulously choreographed around its locations, with Kelly swinging from a lamp-post or balance-beaming down the kerb, and we can map out how those movements respond to, explore and make use of the full space. This entry was posted in Uncategorized and tagged dance, Gene Kelly, genre, Musicals, Singin' in the Rain by Dan North. Bookmark the permalink. Really enjoyed it. Brilliant . Loved the students’ comments as “they”moved with the film.